As I take time to think about this year in video game history, I believe it will go down as unremarkable. This year the video game system’s Xbox One and Playstation 4 were released—two systems that I was not excited about because I already had a top-of-the-line computer. This has been a year of another Call of Duty release, more Assassin Creed games, and a disappointing Destiny release. Blizzard released another terrible Diablo III expansion while also releasing the new Hearthstone card game. 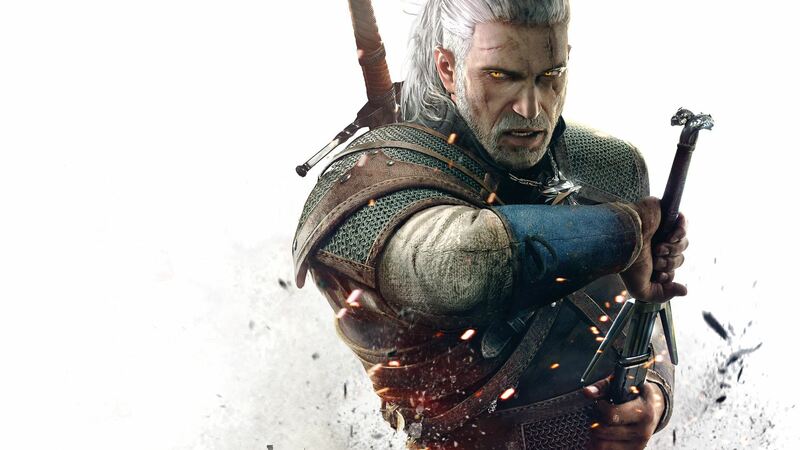 I cannot think of a good video game that was released this year that I truly enjoyed. It is a shame. I am not looking forward to playing video games in 2015. If the current trend of companies releasing the same games over and over again continues, I will just have to become a painter. I think painting a blank canvas will be more fun to do than continuing to play all of the terrible video game sequels that keep coming out. It has gotten to the point of me getting excited to play the upcoming controversial video game Hatred only because it looks like an original video game which is refreshing to see. Fear not, there is one man who can save the video game industry from all of these “Sith” like terrible games. A return of our “Jedi”, the chosen one, Gabe Newell. On the first day of Newellmas, my savior sent to me a sale in Steam. On the second day of Newellmas, my savior sent to me two Team Fortress hats, and a sale in Steam. On the third day of Newellmas, my savior sent to me three Steam Machines, two Team Fortress hats, and a sale in Steam. On the fourth day of Newellmas, my savior sent to me four Trading Cards, three Steam Machines, two Team Fortress hats, and a sale in Steam. On the fifth day of Newellmas, my savior sent to me five Half-Life 3 invites, four Trading Cards, three Steam Machines, two Team Fortress hats, and a sale in Steam. On the sixth day of Newellmas, my savior sent to me six Devs a-making, five Half-Life 3 invites, four Trading Cards, three Steam Machines, two Team Fortress hats, and a sale in Steam. On the seventh day of Newellmas, my savior sent to me seven players a-testing, six Devs a-making, five Half-Life 3 invites, four Trading Cards, three Steam Machines, two Team Fortress hats, and a sale in Steam. On the ninth day of Newellmas, my savior sent to me nine Valve shareholders dancing, eight EA shareholders crying, seven players a-testing, six Devs a-making, five Half-Life 3 Invites, four Trading Cards, three Steam Machines, two Team Fortress hats, and a sale in Steam. 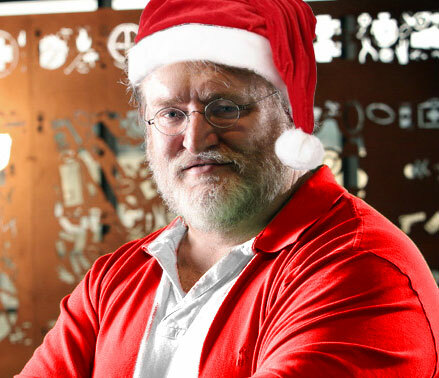 On the tenth day of Newellmas, my savior sent to me ten Greenlight games, nine Valve shareholders dancing, eight EA shareholders crying, seven players a-testing, six Devs a-making, five Half-Life 3 invites, four Trading Cards, three Steam Machines, two Team Fortress hats, and a sale in Steam. On the eleventh day of Newellmas, my savior sent to me eleven new updates, ten Greenlight games, nine Valve shareholders dancing, eight EA shareholders crying, seven players a-testing, six Devs a-making, five Half-Life 3 invites, four Trading Cards, three Steam Machines, two Team Fortress hats, and a sale in Steam. On the twelfth day of Newellmas, my savior sent to me twelve Gabes a-Newelling, eleven new updates, ten Greenlight games, nine Valve shareholders dancing, eight EA shareholders crying, seven players a-testing, six Devs a-making, five Half-Life 3 Invites, four Trading Cards, three Steam Machines, two Team Fortress hats, and a sale in Steam. 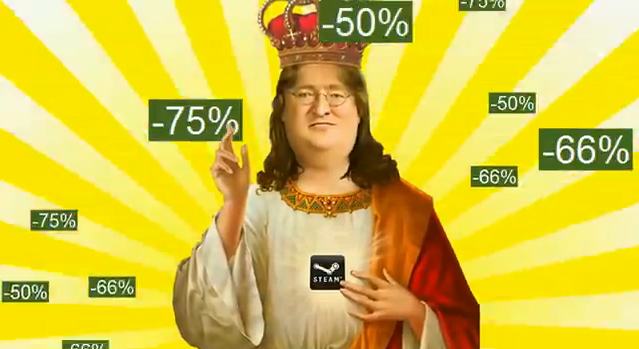 Thank you Gabe Newell for the wonderful service Steam has provided to video gamers around the world along with your twelve days of Newellmas. Steam gives me hope for the future of the video game industry because I love not paying 60 bucks for a video game and instead paying a reduced price on Steam. Another benefit to Steam is how games are digitally distributed. This saves me so much time having to drive to a Gamestop and deal with disgruntled employees. Mr. Newell you are also the man responsible for putting the controversial game Hatred back on Steam Greenlight. 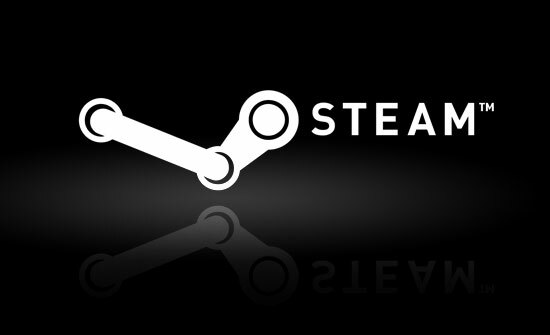 Steam Greenlight is a system where the Steam community can help decide which games will be selected for digital distribution on Steam. 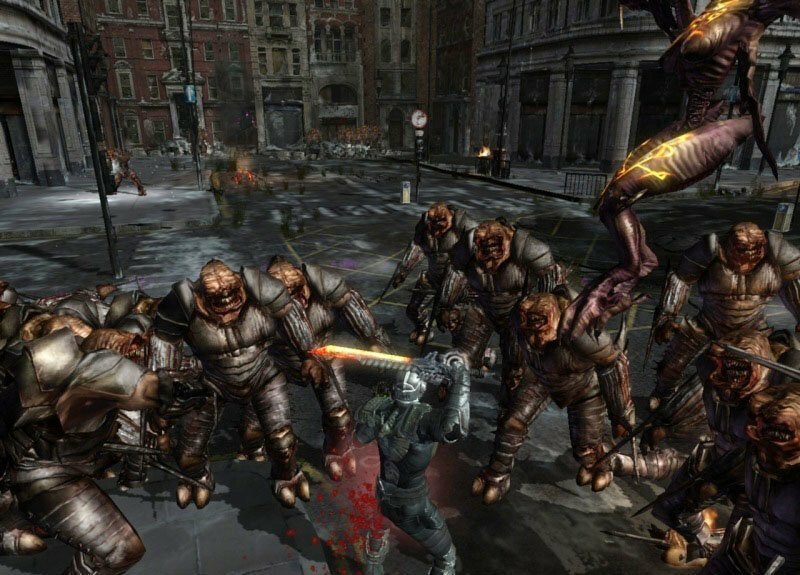 Hatred was originally taken off Steam Greenlight because Social Justice Warriors (SJWs) complained that the game could cause people to be more violent and would send an overall bad message to society. 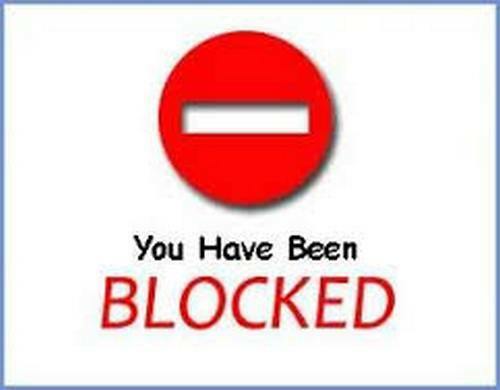 SJWs sought to push their own agenda on the whole video game community by trying to get the game pulled so no one can play it. It is sad that SJWs care more about violence in video games than violence that happens in real life to real people. As we are all heading into the new year with this new site I wanted to personally thank all of the Reaxxion readers. It means so much to have your support because authors like myself want to write articles that you cannot get anywhere else without having to endure SJWs or other corrupt journalism practices. As a gamer myself I wish this site existed years earlier to help steer me away from all the propaganda the video game industry throws out. Happy Holidays to you and cheers to the closing of another year in video gaming history.